'Our politics is a dangerous place' Jump to media player Liberal Democrats should be "unashamedly parochial" in their campaigns on the issues that matter to their communities, the party's Welsh leader says. 'Tomorrow can and will be better' Jump to media player The Liberal Democrats must show leadership in "worrying times", Education Secretary Kirsty Williams tells her party's conference. School ratings 'help target more help' Jump to media player Annual colour-coded school ratings help target support to those who need it most, Education Secretary Kirsty Williams says. Liberal Democrats should be "unashamedly parochial" in their campaigns on the issues that matter to their communities, the party's Welsh leader has said. 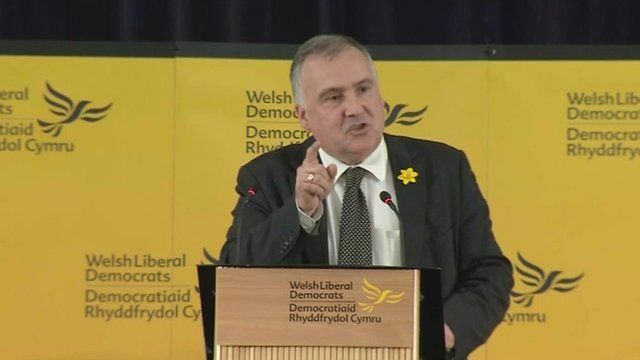 Looking ahead to May's local elections, Mark Williams told the Welsh Lib Dem spring conference in Swansea: "Our politics is an unpredictable and dangerous place, but one stuffed with opportunities."